A family compound that will be built on challenging, uneven terrain in Mission Hills has garnered the blessing of the Uptown Planners. 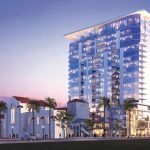 The citizen-elected volunteer board also voted to approve the conversion into condominiums of a designated historic residence in the Bankers Hill/Park West neighborhood. 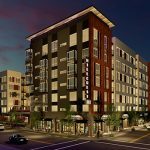 The two votes took place at the Feb. 7 meeting, coming right after the Uptown Planners discussed the seven-story, 111-unit Hillcrest 111 project planned for 1 acre on the southwest corner of Seventh and Robinson avenues. To read our coverage on that project, visit bit.ly/2kPyfMg. 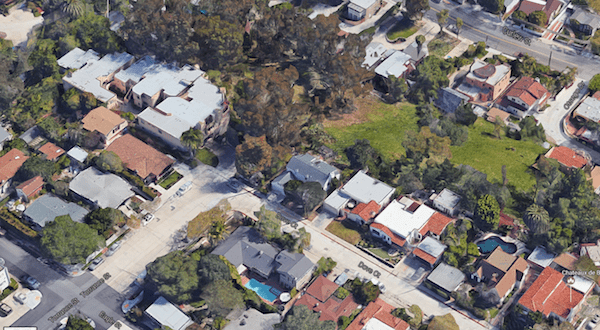 Soheil Nakhshab, CEO of Nakhshab Development Design in East Village, is proposing to build what he called a “family compound” at 549 Torrance St. in Mission Hills. Nakhshab Development Design is known for building projects that are environmentally friendly and fit naturally into a neighborhood. As a member of the Uptown Planners, Nakhshab recused himself so he could make his presentation to the board. He said he would be consolidating 10 lots and a vacated alley into three larger lots in order to construct three new homes designated for his parents, his brother’s family, and his own family. Nakhshab’s wife attended the meeting with their two small children, and she spoke about how the Nakhshab clan is thrilled to be able to patch together enough land so that three generations of their family will be able live together. The vacant land lies behind a number of houses along Dove Court and Curlew Street, and several property owners who would be affected by construction attended the meeting to express their concerns and thoughts. Nakhshab said the property was used in the past as a dumpsite and as an abalone factory. 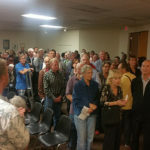 He said one of his biggest challenges would be to remove the artificial fill on the land and replace it with soil, which will need to be compacted. The terrain in the area is uneven, and the owner of an apartment building at 613 Torrance St. said he opposed the proposed project. The owner also objected to Nakhshab’s plan to share and enlarge the apartment building’s driveway off Torrance Street so the developer can construct a 20-foot-wide driveway that would loop around to the family compound. The apartment building’s owner said his tenants had to drive up a knoll exiting the parking garage, and that adding traffic to and from the private driveway would create a safety hazard. Other neighbors feared that motorists traveling on Torrance Street — which ends just before the apartment building but connects to Dove Court — would mistakenly drive onto the private driveway before realizing that it wasn’t a city street. The private driveway will dead-end at the third house, which will be Nakhshab’s home. The neighbors said motorists would have difficulty turning around, but Nakhshab said signage could curb the potential problem. Nakhshab said he had met with San Diego Canyonlands about bringing natural habitat back to the neighborhood and plans to add trees, shrubs and other plantings to accomplish that goal. “We build sustainable properties,” he said. While some neighbors were concerned about traffic and construction issues, other neighbors gave the “thumbs-up” to the project and thanked Nakhshab for working with them to address their concerns. The Uptown Planners voted 12-0-2 with chair Leo Wilson and Nakhshab abstaining. The chair typically abstains, except to break ties. The Process Three application — the midpoint level of scrutiny of the five types of reviews — goes to a staff-level review by the Planning Department and then to a hearing officer hearing. Any appeal of a decision would be heard by the Planning Commission, and the owner of the apartment complex vowed to appeal if the decision is to approve the project. The Uptown Planners voted 11-1-1 to approve the request to convert the Front Street property to condominiums. The developer has gutted a designated historic residence, which he will live in, and will add a three-story condo building over a parking garage. The condo building will have eight units totaling 10,002 square feet. The entire site is 0.181 acres. India Street traffic lane reduction in Middletown. Gary Pence, representing the city’s traffic engineers, described plans to reduce India Street between West Laurel and Sassafras streets from three to two lanes in order to install a buffered bicycle lane on the former east traffic lane. Existing parking will be preserved. The goal is to reduce vehicle speeds and accommodate bicyclists and pedestrians to improve safety, comfort and convenience. Pence said the city declines to put in a traffic sign at Sassafras Street, as a group of residents have requested. Adding parking meters in Hillcrest and Mission Hills, and modifying parking meter hours in Hillcrest. Elizabeth Hannon, head of the Uptown Parking District, outlined the proposal to add parking meters on the north side from 422-510 W. Washington St. in Mission Hills; and the north side of the 1000 block and 1700 block of University Avenue in Hillcrest. All the locations are in business districts, and Hannon said the goal was to create turnover of vehicles every two hours to help the nearby businesses. Hannon also said the parking district has studied occupancy rates at meters in Hillcrest, and recommends shifting enforcement hours from 10 a.m. to 8 p.m. Mondays through Saturdays, except holidays. Fixing University Avenue “gap” in the bicycle lane project. 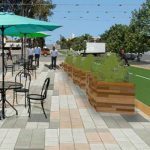 Brian Genovese, a senior traffic engineer, said the city wants to fix a big portion of the “gap” in the University Avenue bicycle lane caused by a compromise approved by SANDAG. 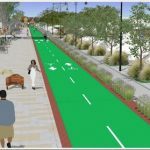 This project would add painted bicycle lands and 12 street trees along University Avenue between Fifth Avenue and Normal Street. This will result with the loss of 29 parking spaces along University Avenue between Sixth Avenue and Vermont Street, but reconfiguration of parking spaces would add 20 parking spaces on Essex Street, three parking spaces on Tenth Avenue and 13 parking spaces on Eighth Avenue. Genovese said the additional parking spaces on side streets would require the approval of property owners and residents who live along those roads. The project would begin after the pipeline improvement is completed, which will require street resurfacing and allow the city to add the bicycling lane at that time. Bike San Diego reminded the audience that there will still be a gap between First and Fifth avenues. Conversion of Sommerset Suite Hotel into The Whitson. Doug Arthur of SENTRE Partners shared plans for turning the shuttered hotel into upscale housing. Arthur said the building at 606 Washington St. in Hillcrest was built in 1986 as an 81-unit apartment complex. But for the past 20 years, it served as a hotel. The developer plans to renovate the property, paint the exterior and add new landscaping. Arthur said the company expected to begin renting out units by mid-June and expected to be fully occupied by the end of July. He called it “high quality, amenity-rich” housing that would include an on-site fitness facility and pool. Arthur said the name pays homage to William Whitson, a major developer of the neighborhood after founding the Hillcrest Company in 1908. Sun-blocking tower or good neighbor? If that photo is correct, I lived in the house that was torn down to build that apartmnet/condo building. The house was at 628 torrance Street at the north end of Dove and the north east end of Torrance. 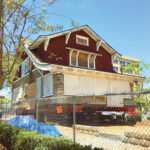 That house was an early craftsman and was part of the entire propert in this article. i n fact this property had a stone pathway down the hillside, a horse show space on the hillside in a flat area. It was never a dump when I lived there. If that photo is correct, I lived in the house that was torn down to build that apartment/condo building. The house was at 628 Torrance Street at the north end of Dove and the north east end of Torrance. That house was an early craftsman and was part of the entire propery in this article. i n fact this property had a stone pathway down the hillside, a horse show space on the hillside in a flat area. It was never a dump when I lived there.